Often imitated, never reached - the legendary, unique Las Vegas Grind has finally returned! After many years of combing the greasy cellars of the underworld, Jazzman finally found the manic mastermind responsible for the original six episodes of the Las Vegas Grind series. And so for the first time in 60 years they stood in the spotlight of strippers, long forgotten, unprecedented acquaintances of Alonzo & the Boppers and The Abstracts, who rocked side by side with the lurid Louie & the Fat Men and The Escorts, and Little Louie & the Finger Cymbals, Gay Poppa, The Savoys, B Bubba, Leo Valentine Trio, and 16 growlers guaranteed to torture and tease. 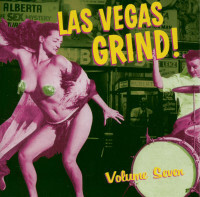 Customer evaluation for "Vol.6 (LP) Las Vegas Grind"